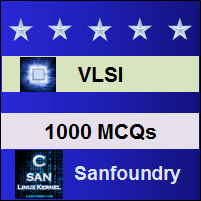 This set of VLSI Multiple Choice Questions & Answers (MCQs) focuses on “Design Rules and Layout-1”. 1. Circuit design concepts can also be represented using symbolic diagram. Explanation: Circuit design concepts can be represented using stick diagrams and symbolic diagrams. Stick diagrams represents different layers with color codes. Symbolic diagram represents the structure with symbols with color codes. Explanation: Circuit designers in general prefer tighter, smaller layouts for improved performance and decreased silicon area. Explanation: Process engineers wants design rules which are controllable and reproducible process. 4. Maturity level of the process line affects design rules. Explanation: Yes, the maturity level of the process line affects design rules. Explanation: Design rules specify line widths, separations and extensions in terms of lambda. Explanation: The width of n-diffusion and p-diffusion should be 2λ according to design rules. 7. What should be the spacing between two diffusion layers? Explanation: The spacing between two diffusion layers should be 3λ according to design rules and standards. 8. What should be the width of metal 1 and metal 2 layers? Explanation: The width of the metal 1 layer should be 3λ and metal 2 should be 4λ. Explanation: Implant for a n-mos depletion mode transistor should extend minimum of 2λ from the channel in all the directions. 10. Which type of contact cuts are better? Explanation: Buried contacts are much better than butted contacts. In butted contacts the two layers are joined together or binded together using adhesive type of material where as in buried contact one layer is interconcted or fitted into another. 11. Which design method occupies or uses lesser area? Explanation: Micron rules occupies or consumes lesser area. 50% of the area usage can be reduced by using micron rules over lambda rules. 12. Which gives scalable design rules? Explanation: Lambda rules gives scalable design rules and micron rules gives absolute dimensions. 13. Devices designed with lambda design rules are prone to shorts and opens. Explanation: Lambda design rules prevents shorting, opens, contact from slipping out of area to be contacted.